Oatmeal raisin cookies recipes are one of the most versatile cookies recipes. A variety of ingredients can be added to the classic oatmeal raisin cookies recipe; you can add chocolate chips, walnuts, dried fruits, peanut butter, cloves, ginger and so on to make different flavors of oatmeal raisin cookies. Oatmeal raisin cookies that are good for the heart: This recipe uses whole wheat flour instead of all-purpose flour. In a bowl, combine 1 cup of whole wheat flour, 1 teaspoon baking soda, ½ cup flax seeds (ground), and ½ teaspoon cinnamon. In a large bowl, mix ½ cup light salted butter, ¼ cup granulated sugar, ½ cup packed brown sugar, 1/3 cup light olive oil, and 2 teaspoons vanilla extract. Beat until you get a creamy consistency. Add two large eggs (one at a time). Slowly add the flour mix, 3 cups of old-fashioned oats and raisins, and stir the mixture. Place flat balls of the dough on ungreased cookie sheets. Bake for 8 to 10 minutes in the oven preheated to 375F. Oatmeal raisin cookies with low sugar: Although this recipe has low sugar, it still retains the crunchiness and deliciousness of regular oatmeal raisin cookies. For this recipe, you will need ½ cup of oat flour, ¾ cup of oats, 1 teaspoon baking powder, ¼ teaspoon sea salt, 1 teaspoon each of cinnamon and vanilla extract, 1 tablespoon coconut sugar or any granulated sugar, 2 tablespoons coconut oil, 3 to 4 tablespoons of milk, and 3 tablespoons of raisins. Combine together all the dry ingredients. To this, add the rest of the ingredients and make 8 to 10 balls with the dough. Flatten the balls and place them onto a parchment paper-lined cookie sheet. Bake the cookies for 10 minutes in the oven preheated to 375F. 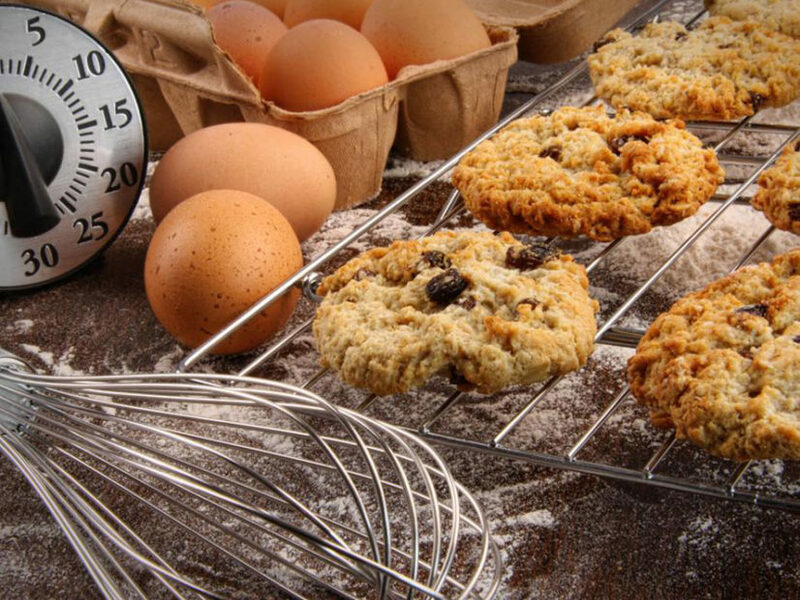 Organic oatmeal raisin cookies: This is one of the healthiest oatmeal raisin cookies recipes. It needs just three ingredients: one ripe banana (mashed), ½ cup organic rolled oats and ¼ cup raisins. You can also add ground cinnamon or peanut butter or chopped walnuts or chocolate chips to add more flavor to the cookies. In a bowl, mix together all the ingredients until everything combines well together. Place flat round balls of the dough onto an ungreased baking sheet. Bake until brown (for 12 to 15 minutes) in the oven preheated to 350F.